Happy Friday, loves! I'm excited to be participating in another round of Ask Away Friday, as it has been a while since I've done so. Today, I'm tag-teaming the link-up with the lovely Sonya K. of Saving Everyday with Sonya K. I get hyped every time I get an update from Sonya's blog, as I know she has some good sale alerts coming in! And we know I love a good deal, right? This exchange has been a great way of getting to know the woman behind the blog. 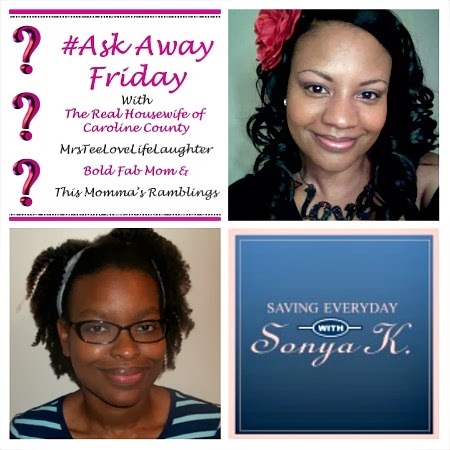 Now if you aren't familiar with #AskAwayFriday, it's a weekly link-up hosted by The Real Housewife of Caroline County, Mrs.Tee Love Life and Laughter, Bold Fab Mom, and This Momma's Ramblings. It's a great way for bloggers to meet and get to know each other better. Partners exchange ten questions and answer them on their respective blogs. Sounds pretty cool, right? Below are the questions Sonya asked me and my responses to them. We are both 90's kids so lets start with some questions about the 90's. 1. As a kid I thought that 90's fashion was "all that", who doesn't love bright colors, spandex, and overalls to name a few. What were some of your favorite fashion trends from the 90's? I loved the entire "around the way girl" look of the 90's. Combat boots, bamboo earrings, and overalls were definitely among my favorites. 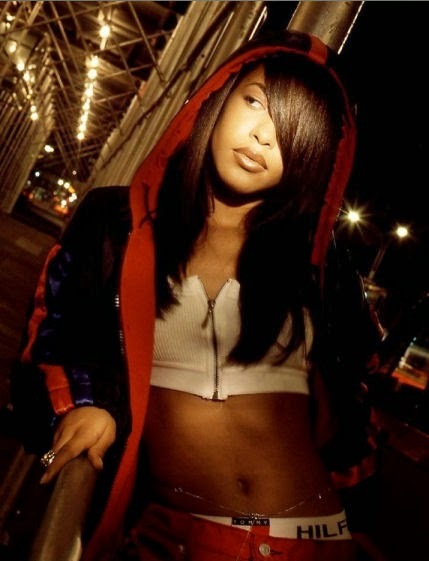 And thanks to Aaliyah, I've worn my share of oversized Tommy Hilfiger Jeans, Timberlands, swoop-bangs, and batman sunglasses. The 90's were a great time to be a tomboy, indeed. 2. You mentioned watching TGIF on Fridays in one of your recent posts. I loved Family Matters. Laura with Steve Urkel or Laura with Stephan Urquelle- which couple did you like the most? Don't get me wrong, I loved Stephan! He was something cute and charismatic, wasn't he? However, I wish Laura would have just went for Steve. Do you remember that one episode where she kept having dreams about Steve and eventually kissed him in front of everyone? I can't remember all of the details because it was so long ago, but I remember rooting for Steve instead of Stephan in that episode. Steve was so sweet and sincere. He deserved a woman who loved him for who he truly was--geekery and all! 4. A few weeks ago you have a post about when you first fell in love with Hip Hop. MC Hammer made rap mainstream for a lot of people. I LOVED me some MC Hammer. Were you a fan, if so what was your favorite song by MC Hammer? I used to love MC Hammer back in the day! Oh, the memories I have of the MC Hammer doll and the Hammerman cartoon. Even though I had no clue what he was talking about in his songs, I was a fan. I was an adult before I even knew what "pumps and a bump" meant! Nonetheless, I was singing along with his songs on the radio and begging my mom to let Aunt Nancy sew me a pair of hammer pants. I think my favorite Hammer song is "Too Legit to Quit." I loved his rendition of "Going Up Yonder" too, as that is one of my favorite gospel songs. I know you like to write, so here are a few literary questions. 5. Do you have a favorite poet, if so who? My favorite poet is Maya Angelou. Though I love many others, it was Maya Angelou's works that inspired me to share my voice through the written word. 6. Do you have a favorite book that you can read over and over again? Invisible Man by Ralph Ellison, hands down. I discover something new in this literary gem each time I read it. You post a lot about fashion, so lets talk fashion. 7. Has your sense of fashion changed since becoming a mom? If so, what are some of the ways your style has changed? I wouldn't say my style has changed because I became a mom, but I will say my style has matured through time. Before I was a mom, I was a nineteen year old kid. I wore graphic tees with bright accessories and Nikes to nearly every event. And though I still love my tees, jeans, and Jordans, I know how to get dressed for the occasion. Oh, and I do wear less skin-tight clothing now. Lol. 8. I love a good deal and hate to spend a lot of money on clothes. Are you a bargain shopper or do you like to splurge when it comes to fashion? I'm a bargain shopper all the way. I rarely splurge on apparel. Every now and again, I'll buy a really nice pair of shoes or bag. And I might just buy wardrobe staples at retail price. But everything else is with a deal, a coupon, on sale, or possibly thrifted. I love to save a dollar. 9. Unlimited funds fantasy shopping spree for one store only. What store would you choose for the ultimate shopping spree? If I had unlimited funds, I would still be in the stores budgeting. It's just in me. So this question is really hard. I suppose I'd go to a department store that has everything, like Macy's or Nordstrom. 10. My daughter is about to turn 2 and she already wants to pick out her clothes (she will actually say no if you pick something from her drawer that she does not want to wear). 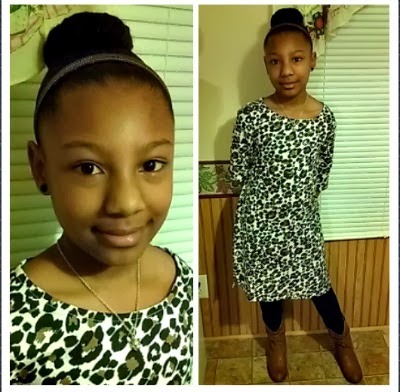 Is your daughter a budding fashionista or are you still able to pick out most of her clothes? Aww, that's too cute! My daughter is 9, so she pretty much wants creative control over her style. But since I buy simple mix and match pieces for her, she could put just about anything together and it "goes." She came up with this look all by herself last week and was very proud! When it comes to church and family functions, however, I will pick out a couple of outfits for her and give her options. It's been so much fun answering Sonya's questions! To get more familiar with Sonya while scoring cool deals and savings, click the button below and show her blog some love. Her answers to my questions go live today as well, so make sure you check them out and tell her I sent ya!